City of Ottawa (Single Tier Ottawa)Record Owner? Log in. Pop. 330,228. Capital of the Dominion of Canada and city in Reg. Mun. of Ottawa-Carleton on the Ottawa and Rideau Rs., and Hwy 417, 110 km N of Brock ville and 200 km W of Montreal. Ottawa is linked with Hull, QC, across the Ottawa R. by five automobile bridges and one railway bridge. There were only a few settlers in the area when Col. John By and his Royal Engineers arrived in 1826 to construct the Rideau Canal, which would eventually link Ottawa with Kingston at L. Ontario. returned to Vermont. The settlement was called Bellow's Landing and later, Richmond Landing. Col. By laid out a townsite at the northern terminus of the 208-km-long canal project; by 1827 the settlement was known as By town. In 1855 the name was changed to Ottawa, after a First Nations Peoples band, the Outaouak, that occupied an important position on the route between the Ottawa R. and Georgian Bay. The Canadian government dithered from 1841 to 1857 on selecting a site for the national capital. In 1857 it passed the buck -- and a short list of five sites -- to Queen Victoria. it was remote from the hostile United States; it was industrially prosperous, and it had a naturally beautiful setting at the confluence of two major rivers. The Parliament Buildings were in use by 1866, and Ottawa was confirmed in its status the following year by the British North America Act, which established the Dominion of Canada. In 1916 a spectacular fire levelled the Centre Block ofthe Parliament Buildings. For the next four years the daily workings ofthe House of Commons and the Senate were moved to the Victoria Museum, now the Canadian Museum of Nature. MPs sat in an auditorium; senators worked out of the former hall of invertebrate fossils. 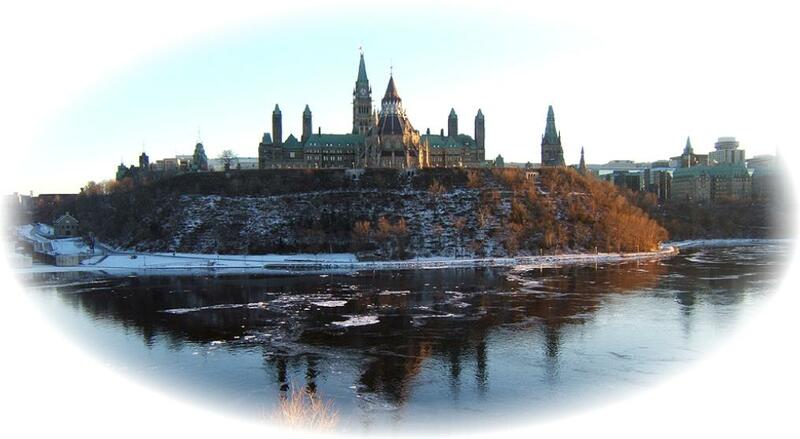 Thanks to the efforts of the National Capital Commission (NCC), Ottawa has remained beautiful. The NCC works with all municipalities within the 3,000-square-km (1,158 sq. mil National Capital Region, (which includes neighbouring Hull and a big chunk of Quebec), to coordinate development in the best interests of the entire region. -- a 6.4-km-Iong stretch of the Rideau Canal kept cleared and smooth and provided with heated huts, food concessions, and skate-sharpening and rental services. The city also contains a very long list of beautiful and/or historically important buildings and is the scene annually of many festivals, expositions, celebrations, presentations, and other special events. Natural Resources Canada for the City of Ottawa. Have something to say about City of Ottawa (Single Tier Ottawa)?